I get asked a lot about starting a blog…and I just want to start off by saying, there is nothing special about me! If I can do it, so can you!! I promise! What started as a way to share photo sessions years ago (2009 actually!) has grown into a way for me to earn a small income each month by sharing products we use and projects we have going on! Did you know there are blogs out there on just about every subject you can imagine?? Really! So, if you have a unique story, job, hobby, passion or skill that you have always wanted to share, you can have a blog too! 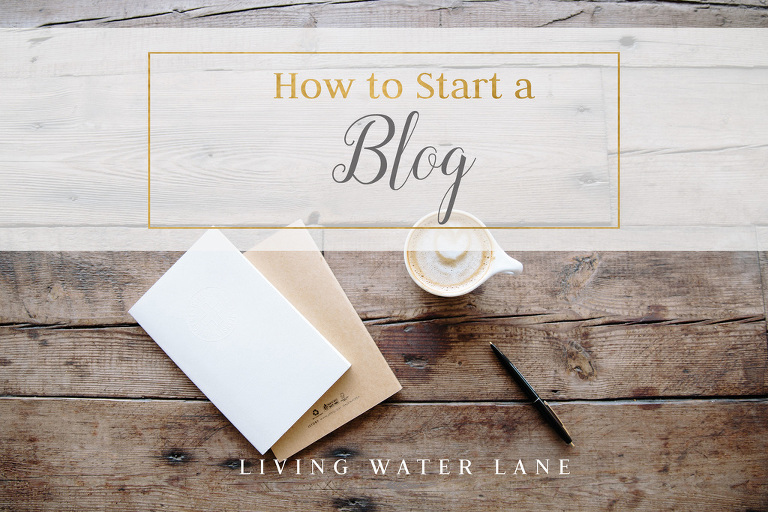 To answer all the questions in one place…and to create a giant resource for those out there that want to start their own blog, I figured putting it all into one past might help! These are my opinions…but, they are honest! Links below may be affiliate links provided for your convenience. If you click, I earn a small commission at no extra cost to you! See Full Disclosure Here. There is a reason that you want to blog. Write it down. Is it to share your favorite meals and how to save money when you are at the grocery store? Awesome, write that down. Is it to share your adventures traveling and how you find the best deals? Great, write that down. Or maybe, you love to craft and need a place to share your latest creations and how you made them. That’s perfect, write that down. Whatever it is…write it down. Put this dream in writing. From there, begin to plan out words that describe your passion and purpose to help you as you decide to name this venture that you are about to embark on. Think this dream is a hobby and can’t possibly make you money. You are dead wrong. There are people making full-time salaries at home blogging. It’s real. And, its possible. So lets put this plan into action. Your name is your Brand. Once you have started this process and have written down your Purpose and any words you can think of associated with it. I want you to begin to brainstorm your business name. This is where we begin to build your brand. Realize that what might be appropriate in this season of life, may not forever fit. Just be mindful of the choices you are making and whether they will work forever more. A Mom of twins may want to highlight that in her blog name (twinsmoms.com or momoftwins.com as examples), but if her blog begins to shift to other avenues 5 years down the road (business, budgeting, couponing) then she might find her brand is not able to grow with her. Once you have found the name you hope to use…begin the process of checking it to see if it is available EVERYWHERE. I can not emphasize enough how important it is to be able to use the name you want in all places (Website address, Facebook, Twitter, Pinterest, Gmail, Linked In, Google+, etc). If you find something you love and it is not available…start playing with variations of words or synonyms. I have faith that not every good name is taken! You will find just the right one! To check if your web address is available, see below under Hosting! When I first started out blogging, years ago, I joined Fatcow as my Domain Provider and Host. They had an amazing special going at the time (and often still do) and I was very pleased with their service for about 6 years. It was at the time that I needed a new blog domain and new hosting that things started to go south. I was advised to buy a new bundle of services for my new domain and was never advised that I could have saved a lot if I just added the new domain to my existing hosting package. For those out there who may currently have more than one blog, you can actually just pay one hosting fee if they are all together. Contact me if you need more info on this! I began to reserach other hosting providers and found that a lot of the “Big Name” bloggers that I followed recommended BlueHost as the provider to use. I continued to do more research and came across a website that had great infomation about some of the big name companies out there that I had NEVER heard of. Honestly, I really didn’t care…I just wanted cheap and fast. But, guess what…its important to care! If your site has problems, it is AWFUL! My Host is SiteGround, and they are amazing! In ALL the blogging groups that I am a part of, I see people commenting that they are having problems with their BlueHost account and looking to switch, while everyone’s number 1 recommendation is always SiteGround! 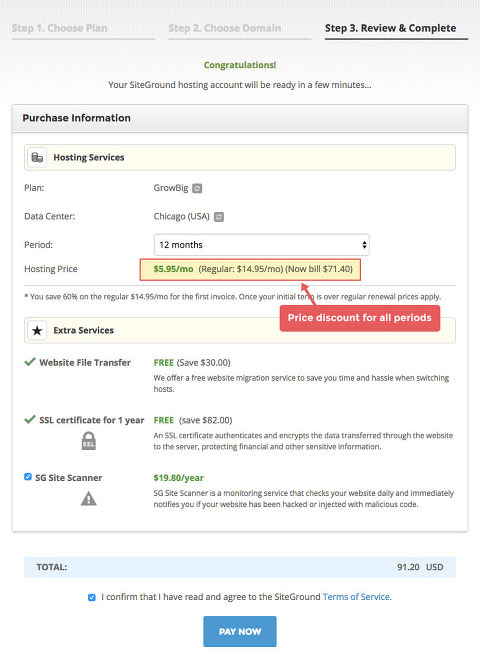 You can choose to buy a new domain (this is a seperate yearly fee…typically $12 or less), or sign up with an existing domain. You can use this form to see if the name you want is available! Simply type in the name you are interested in and choose .com then click “Check Availability”. It is suggested to buy your domain name seperate from your host…this time around I did that…Go Daddy and NameCheap are two other sites you can check out for domains that are inexpensive! 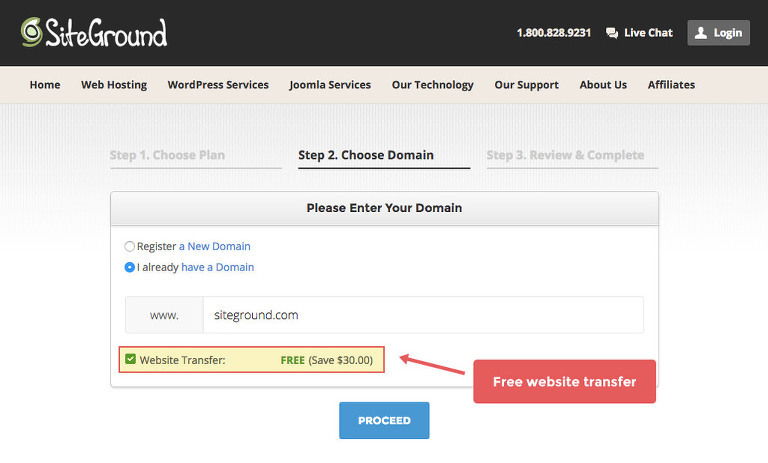 If you have an existing domain, SiteGround makes it SO easy to transfer it. 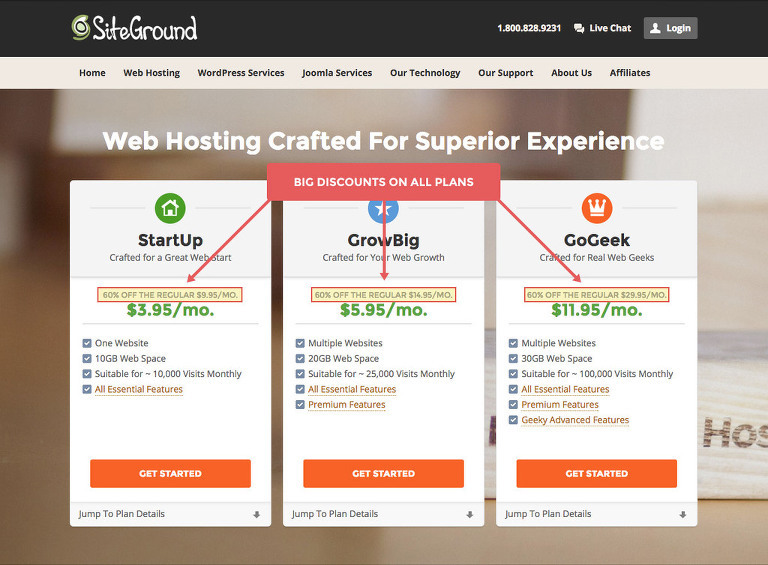 Unlike many other hosting providers, SiteGround allows you to apply their discounted price to any term you choose whether it is one year or more. Honestly, I like to extend mine out as long as possible, but for those who are starting a new blog, it may be scary to commit longer than a year! SiteGround will let you choose! Once You have completed the steps above to purchase your hosting, you will have a few more technical steps to take. SiteGround has amazing customer support and tutorials to help you navigate. I have gone through this process confidently several times (and I have no formal training)…but if you need extra help…I recommend checking out Grayson’s step-by-step Guide through the Technical Stuff. His post is so comprehensive and I know that I can not create anything as thorough! Be sure to check out SiteGround’s Info on adding WordPress to your blog. You will need to install this in your Control Panel to move forward! PS…Don’t worry, if you can not figure it out, then SiteGround will help you! First & Foremost, Elite Blog Academy changed my game. I went from a casual Blogger who shared Photography Sessions, to a committed beliver that I can change the future for my family by blogging. I am that passionate about it. They only open enrollment twice a year, so I will be sure to let you know as soon as it opens again! Subscribe to my newsletter to be the first to know about Elite Blog Academy’s newest class opening! Ultimate Bundles is the next greatest thing that I stumbled across. I am still working through the resources that I found in the Genius Bloggers Bundle. This will be offered again in October, and by joining my list, you will be the first to hear about it! This Bundle saves over 97% off the Retail Value of these products if purchased seperately! I made over $300 in my first month of blogging because of that one class that I took! It taught me exactly how to set my site up on each Affiliate Network! Speaking of that Class, Affiliate Marketing for Bloggers was its name. You are not able to access this class in the Bundle now, but Tasha has an amazing FREE Ebook that will walk you through how to make money from Affiliates as a blogger! She is amazing! She also offers a class that is available twice a year and I will be sure to let you all know when it is available again! I used her Pinterest Strategy Guide to set up my Campaigns for Board Booster and to make sure my Pinterest Game was on point. For those unfamiliar with it, Board Booster is a program that will pin to Pinterest automatically on your behalf and regular intervals. It is a great tool to help grow your Pinterest reach! I also used her Core Affiliate Strategy to learn more about Affiliate Marketing…this was before I took Tasha’s class above…if I had to choose only one…I would wait for Tasha’s class to release again later this year! I am going to list them and my thoughts on each…then I suggest checking each one to see what you like best! MailChimp – This is the service that everyone starts with. It is free up to 2000 subscribers, but once you do get to their paid level, it is much more expensive without many additional features. I did not want to start with Mailchimp simply because I did not feel that I would stay with them long term and honestly did not want to get everything set up to later have to switch it all and learn a new system. Drip – This is the one that I thought would be my forever platform. I watched a video of a blogger sharing her Email Sequencing and Automation and I fell in love! I could see the potential of all the great things she was doing. Yet, when I opened up this program to start working, I could not make it come together for myself. Part of the problem is that I am just not quite there yet in my blogging journey. The other part is that I am not positive my mind works in the way that Drip is operating…LOL! Either way, if you have an established email list and need more Automation, this would Definitely be worth checking into!!! MailerLite– (This link will give you a $20 credit when you sign-up). This is the email program I am currently using. I have tried others and found them to be very confusing and frustrating. Although I am just getting started, I like that this program is Free up to 1000 subscribers (similar to MailChimp, but MailChimp was way more expensive once you have to start paying). MailerLite also includes free Landing Pages which is an awesome option that you do not find in other Services! Once you decide which service is right for you, I highly suggest reading Inbox Invitation by Sarah. She has a reputable blog and an email list that she is profiting from. She wrote this no-nonsense Ebook to help others learn to nurture their email list and even includes over 50 samples of her past emails and how she uses Email Marketing to not only connect with her readers, but to share products and services with them! Inbox Invitation is an amazing resource!!! How many of you know that a strong Social Media presence is key for your business no matter what type it is? Probably everyone, right? Now, how many of you know how hard it is to do ALL THE THINGS that are needed to maintain a strong social media presence? If you have tried, you are out there waving your hand…I see you!!! Problem 1 with Social Media is that it requires posting multiple times a day to create the kind of reach your business needs. Problem 2 is that their is a black hole you fall into overtime you log into your accounts…many times we are sucked in before we even realize it! So, staying off Social Media while maintaining a presence is really hard! Here are the helpers you need to know about! Buffer – This is a good service that will allow you to connect about 10 different accounts including Instagram and Pinterest for around $10 a month with 100 items in your queue at any given time. There is a Free option that will allow you to manage 1 account per social network…this could be a great option for a small business. It will allow you to queue 10 items at a time which can cause you to have to plan your posts more often each week…but, it is great to get used to the program! Post Planner is what I am now using for Social Media Scheduling for Facebook and Twitter. It allows me to post up to 1000 posts at once. It allows for recurring posts and “campaign” type posts that I can repeat regularly. I can search for new content right in the app which is extremely helpful…and it shows all your post analytics in a very user friendly way. There is a $3 mostly option…but I need the $9 a month for the number of Facebook/Twitter accounts that I manage. Later (this link will get you 10 extra posts per month!) is the FREE program that I use for Instagram. As a photographer, Instagram is a great place to share my work. It is one that I have GREATLY underutilized. I am working hard to change this for the Fall and year to come! I will begin scheduling weekly posts for each of my accounts with Later and share personal as well as blog posts and other related items as I see a need! It is important to know, Instagram does not allow any program to post on your behalf. When you schedule in Later (whether on your computer or phone), it prompts you from your phone to post…the process is very simple! Finally, Trello is one of the best Free secrets out there! I am just beginning to understand all the ways it will help me increase productivity and organization, but I am So excited for its potential to revolutionize my workflow! I believe I saved the best for last here…so if you made it to this point…reward yourself by just going ahead and signing up! I hope that you have found this list to be helpful! I will constantly revisit this post and add to it or edit the things that are working or not working. Please, please, please feel free to ask questions or email me for help! I would love to walk you through this process! I believe in the power of blogging that much!